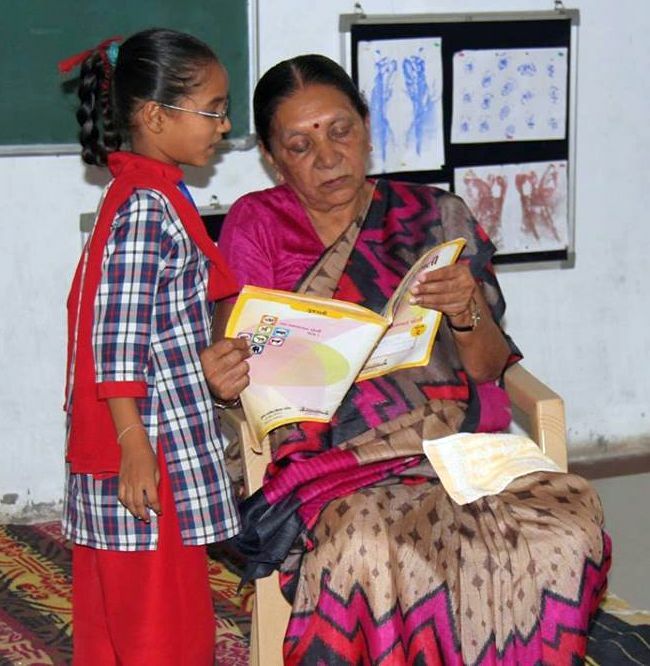 Rediff.com » News » Patel or Rupani: Who will succeed Anandiben? Patel or Rupani: Who will succeed Anandiben? About two months ahead of her 75th birthday on November 21, Anandiben Patel has offered to step down as Gujarat's first woman chief minister. In a Facebook post, Patel said she decided to step down keeping in mind next year's assembly polls and the Vibrant Gujarat summit. The resignation would give her successor enough time to settle down, she said. As she steps down, a look at the top two contenders -- Nitin Patel and Vijay Rupani -- who could become Gujarat's next chief minister. 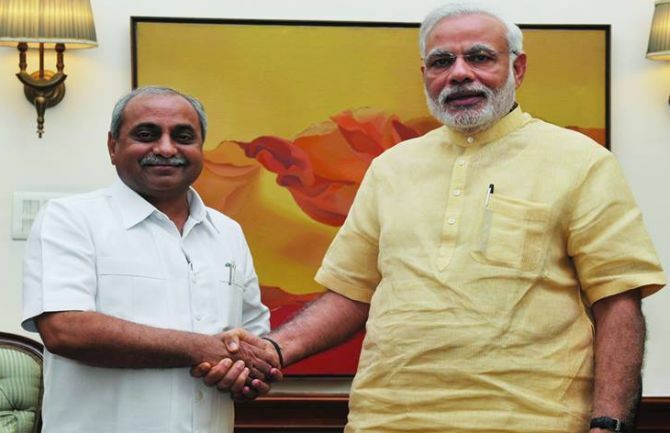 This is not the first time Nitin Patel is being considered a strong contender for the post of Gujarat chief minister. 'I am ready to be the chief minister if the party asks me to take up the job,' he had said in 2014, during the Lok Sabha elections. Considered a seasoned politician, Patel rose up the ranks over the years, especially in the last two years as the second-in-command of CM Anandiben Patel. Currently serving as health, public welfare and roads and building minister in Gujarat, Patel has also been a businessman, having dabbled in cotton ginning and oil pressing. Having contested his first assembly election in 1995, Patel has usually won from the Kadi constituency and became a cabinet minister in the Keshubhai Patel government. He has been in the party for about 30 years and has served in various positions within the organisation. While his industry friendliness could help the state continue to be a favoured investment destination, Nitin has not been favoured among the Patidar community, despite being a member. If chosen for the post, he might face a tough task in placating the community. Vijay Rupani, who turns 60 on August 2, might get a surprise gift. Speculation is rife that he is one of the top contenders for the CM's post. Rupani was made president of the Bharatiya Janata Party's Gujarat unit in February. His appointment, insiders said, was delayed by almost a month owing to differences between Anandiben Patel and BJP President Amit Shah. He replaced the Leuva Patidar leader, R C Faldu, and his appointment came at a time when the party was facing serious challenges from the community. The appointment was seen as a mark of confidence the BJP brass had in the leader from the Baniya community. A Jain Baniya, Rupani does not belong to one of the majority communities in the state; Jains make up only one per cent of Gujarat's population while Baniyas comprise three per cent. The BJP selected a non-other backward classes and non-Patel leader at the helm to avoid a tricky political situation, sources said. 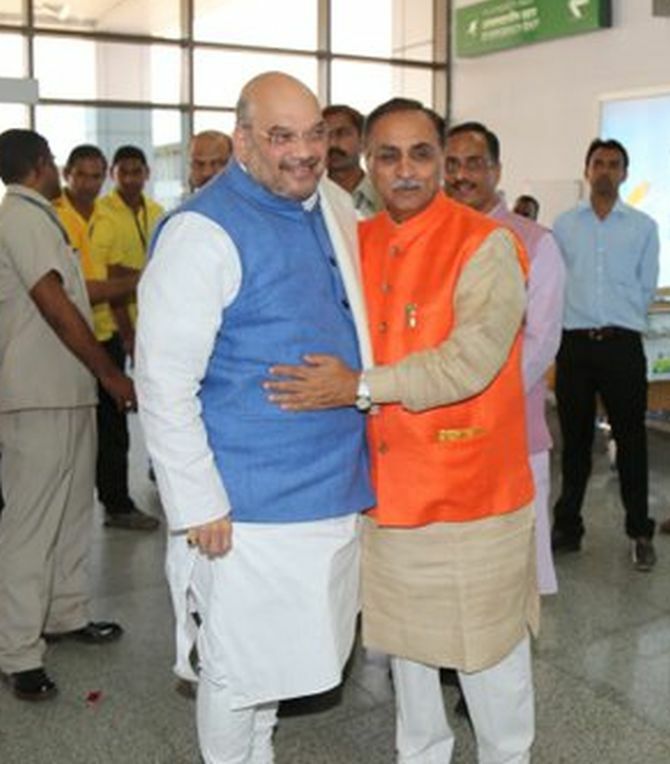 Many see Rupani as an Amit Shah confidante. Hence, his appointment hinted at the latter's increased indirect control of the state unit, where rumours of factionalism are rife. Rupani was a cabinet minister with portfolios such as transport and labour & employment. As Gujarat party president, Rupani was required to consolidate the cadre amid challenges such as the Patidar reservation agitation. Also, given the party's poor performance in rural areas during the recent local body polls, Rupani's role was deemed to be crucial in maintaining and improving on the party's prospects in the assembly elections in December 2017. Rupani has also been the party's general secretary and was an active member of the Akhil Bharatiya Vidyarthi Parishad. Born to Ramniklal Rupani in 1956, Vijay holds a bachelor of arts and an LLB degree. He started his political career as a student activist, and eventually joined the RSS and thereafter the Jan Sangh in 1971. He is the only minister in the state cabinet to have been jailed during the Emergency. He is married and has a daughter and a son. So what happens when Anandiben turns 75?